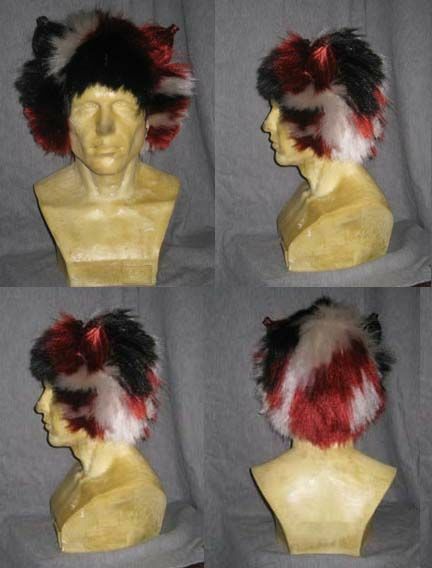 For this you will need Pantyhose or a nylon wig-cap, Hot glue, at least 3 packages of Jumbo braid, a marker, scissors, a pet brush or comb and a mannequin head. Stretch your pantyhose over the mannequin head. 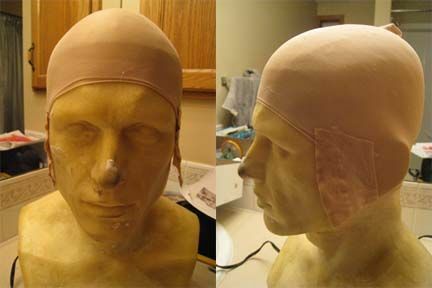 Cut some triangles of the nylon to glue to the sides of the wig, these will be your ear-flaps. 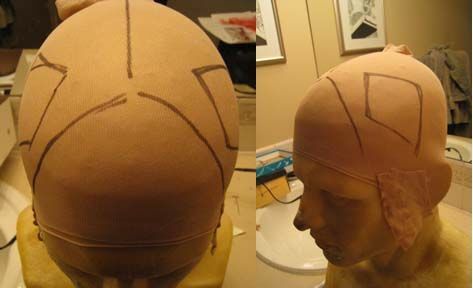 Using your marker, draw some guidelines for the bangs and the ear placement on the wig. I am using an assortment of Kanekalon synthetic fiber hair extentions, they are all 100% Kanekalon (very essential, as 100% Kanekalon is more heat and fire resistant than those mixed with other plastic fibers). I get my Jumbo braid hair extentions from Doctored Locks, however your local beauty and hair salon may have a selection of hair extentions you can use. 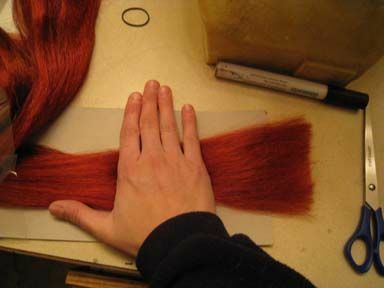 I use my hand to measure out the jumbo braid for cutting. I use twice the width of my hand. 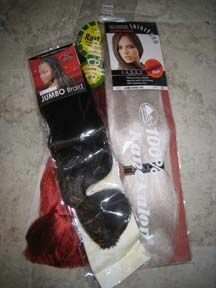 When in doubt, it is always better to use a longer strand, as you can always trim the wig down once it is completed. Take a small pinch of hair, fold it in half, and add a dab of hot glue. Press the glued end of the bundle of hair to the nylon wig base. I like to start with the bangs, but you can start anywhere on the wig you like. 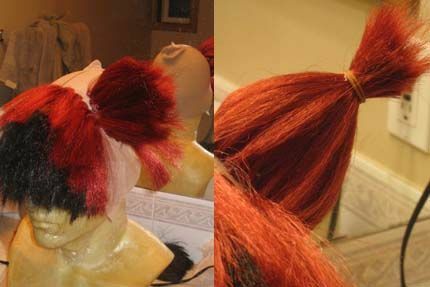 Continue the process of gluing small bundles of hair to the wig base. Note the large spaces between bundles; you do not need to completely cover the wig base. 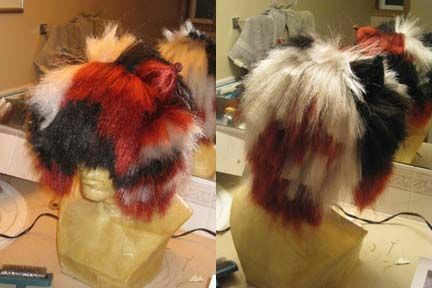 The fibers will cover up any patches between bundles, and the extra spaces will allow for more air-flow and increase the stretch of the wig for larger or smaller heads. For the ears: once you have glued the fiber in place for the ears, you will need to shape them. I take the bundle of hair and add a rubber band to hold the material in place. Try to place the rubber band BELOW where you actually intend to make the point of the ears. Take a very small amount of kanekalon fiber and tie it above the rubber band. Use a dab of hot glue to hold the fiber in place, then wrap it tightly around the tip of the ear. I like to coat the entire tip with a thin layer of hot glue to make sure the bundle holds tight. You may trim the end for a nice clean finished tip. Once the ear is complete, you may remove or cut off the rubber band. Contine to add bundles of hair until the entire wig base has been covered. Use a pet brush or large toothed comb to comb out the wig. This will remove any loose strands of fiber. This is a very shaggy wig, so will need some trimming to shape it correctly. Take your time in the cutting process to make sure to style the wig just how you want it. You may use extra strength hair spray to assist in shaping the wig. Now you wig is complete! 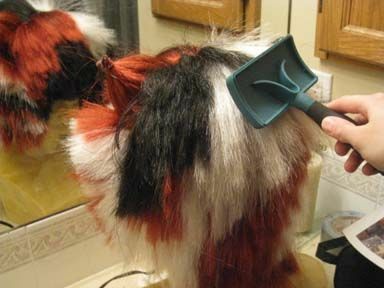 When wearing your cats wig, you will require spirit gum to glue the ear flaps to your face. You can get spirit gum at your local costume or hobby shop (usually around halloween). Now you're ready for the Jellicle Ball!